If we gave our coastlines an environmental report card, what grade should they get? 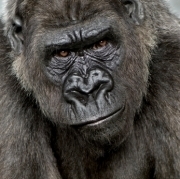 Health Factors Threaten Gorillas – But Why? What's a significant threat to the survival of captive gorillas? Surprisingly it's heart disease. What do you get when you cross folk art with photonic technology? A very bright idea. Let's talk about high fashion and Target, the big box store. The two seemingly opposites converged recently. Believe it or not, just two generations ago, it was unheard of not to recycle glass beverage bottles. Today, that idea itself is getting recycled. If you can't stand the heat...hang in there? That's what some species are doing in response to climate change. Looking for an environmentally conscious vacation that's out of the way? Try Madagascar. The new frontier isn't to the north, south, east, or west. It's up, as in skyscrapers. And, the tallest? The Burj-Khalifa tower in Dubai. "Cradle-to-Cradle" is the newest buzz in green manufacturing circles. It's the next evolution of the idea of "Cradle-to-Grave." Alternative fuels are more environmentally friendly than petroleum products, right? Actually, that's not always the case. Alien mussels are muscling their way into our waterways. And like unwelcome guests, once the move in, they're almost impossible to move out!